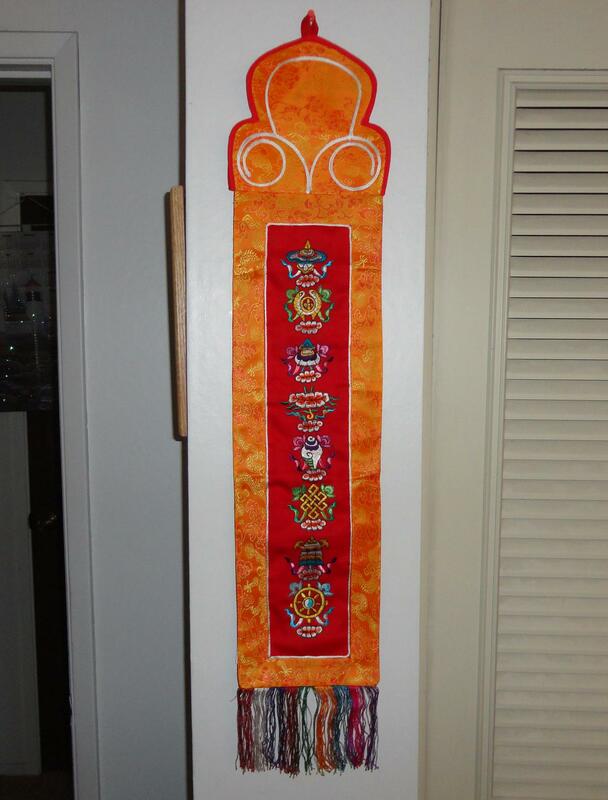 This is a Nepalese banner with the Eight Auspicious Signs of Buddhism that I have hanging on my wall at home. I’ve given such banners to friends as housewarming gifts, as the signs are meant to offer good fortune. Since the symbolism is interesting, I thought I would take a look at it. The Eight Auspicious Signs or Symbols, or Ashtamangala in Sanskrit (ashta, eight, and mangala, auspicious), can be found in a variety of different forms in Hinduism and Jainism in addition to Buddhism. In the latter, typically the Signs represent the offerings made by the gods to Buddha after he attained enlightenment. Sometimes the eight appear as a single unit, but more often as separate entities. The objects have become sacred in themselves, and are often present, or pictured, in homes, monasteries, and public buildings. They can also be sewn onto clothes or furniture. Each can be used as a visual meditation aid in the manner of a yidam (a deity or enlightened being on which one focuses during meditation). In Chinese and Tibetan traditions, the eight objects also correspond to the eight vital organs of Buddha’s body (see more on this below). The objects have been turned into mudras, or hand gestures, and are performed by monks as they chant their prayers. In Hinduism, the Eight Signs probably began as royal insignia for coronations and other official ceremonies, and are still often present at special occasions like weddings. At some Chinese monasteries the symbols can be seen on lotus pedestals in front of statues of the Buddha. Tibetan monks sometimes create these symbols on the ground with chalk or powder in order to welcome religious dignitaries to their monasteries. The order in which the Eight Signs are presented can vary from tradition to tradition. 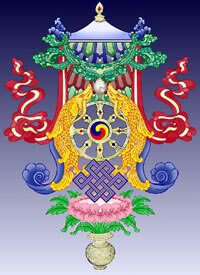 I’ll discuss them in the order in which they appear on my banner, which is that typical of Tibetan Buddhism. Due to an outage, I didn’t have computer access for most of yesterday, and therefore couldn’t post my Sunday Salon. Figuring that late is better than never, here it is! For this week’s entry I’m using a format that some other blogs use; I’ve borrowed it from the excellent book blog Sophisticated Dorkiness. Reading: Yesterday I finished Myths of Light by Joseph Campbell, a most enjoyable book although a little repetitive of themes that he has addressed in other books like The Masks of God series. Still ongoing is the exhibition catalog Out of Character: Decoding Chinese Calligraphy, in which I’m reading today, and How to Meditate by Pema Chödrön. Reading Along: I rarely read along with anyone. The Woody Allen line about not wanting to belong to any club that would have me as a member applies here, as always. Watching: I’m continuing to work my way through the recent Criterion release of Pierre Étaix’s wonderful films, which, I believe I’ve said before, would almost certainly be appealing to any Jacques Tati or Buster Keaton or silent comedy fan. Yoyo (1965), which I watched last night, is the most ambitious of his films I’ve seen so far. Listening: This also qualifies as watching, but tonight Link TV’s Global Spirit program is rerunning an excellent documentary on the Sacred Music Festival presented each year in Fez, Morocco. I remember this being an inspiring program with some great music, and I’m looking forward to seeing it again. Making: Last night’s vegetable curry made with Thai and True yellow curry paste was outstanding, if I do say so myself. Sometimes my cooking improvisations fall flat, but not this one! Blogging: This past week was a slow one for blogging. But I have been working on an item on the Eight Auspicious Signs of Buddhism, which I hope to post on Monday or Tuesday. Promoting: All I would like to promote this week is the American Red Cross and its continued relief efforts in Oklahoma and elsewhere. Hating: Technology and I seem not to agree with one another anymore. I’ve had repeated plumbing and internet problems recently, and after two repair trips, my car still wants to die at every third or fourth stop light. Perhaps a new mechanic will find the problem this week. Appreciating: A photo recently posted on my Facebook page of me with my six-month-old friend Benjamin Dakin got more attention than anything else I’ve ever had on Facebook. I think that from now on, I’ll just post random cute baby photos. Wanting: A couple of book orders from Powell’s and Amazon should be arriving soon! Because the shelves and piles of books I have now still allow me to move around my apartment, and we can’t have that. Anticipating: A trip to San Francisco may be coming at the end of June, and more ambitious travels are being contemplated. See you next week, if my internet works. 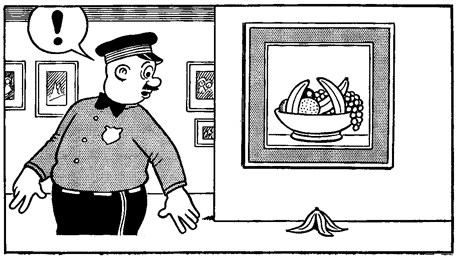 From the comic strip Nancy. See the Nancy Panels tumblr for more. After a few weeks away, I’m once again visiting the Sunday Salon with an update as to recent doings. The blog has lain dormant for over a month, and even I don’t know exactly why, given that there is plenty to write about. Laziness is the answer that I’ve latched onto, although as Julia Cameron points out, probably correctly, in The Artist’s Way, laziness is very often a mask for various forms of fear. Books: While writing about books has been a problem, reading them hasn’t. Recently completed are the aforementioned The Artist’s Way, and Martin Sheen and Emilio Estevez’s memoir Along the Way. Nancy Pearl’s Book Lust to Go provided me about fifty hints as to future books to read, which, with my “to be read” stack growing larger and larger, is about fifty more than I absolutely needed. But I don’t mind. 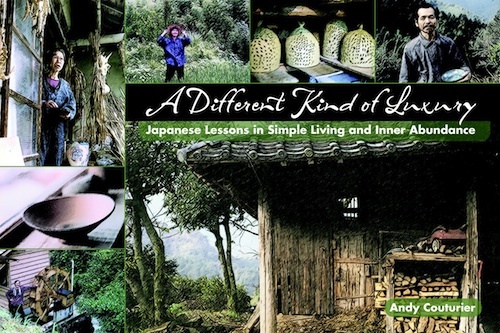 Andy Couturier’s A Different Kind of Luxury, which profiles eleven people who have “dropped out” of Japanese urban, commercial society and found fulfillment living in the countryside, was the subject of a book review that got me back to the blog yesterday. Currently underway are Joseph Campbell’s Myths of Light: Eastern Metaphors of the Eternal, Pema Chödrön’s How to Meditate, Jonathan Spence’s Return to Dragon Mountain: Memories of a Late Ming Man, and the exhibition catalog Out of Character: Decoding Chinese Calligraphy. Music: Compact discs are accumulating as well, but I haven’t been listening to much recently. One recent arrival which is sure to get attention soon is Kaija Saariaho’s oratorio La Passion de Simone, based on the life and thinking of the philosopher and mystic Simone Weil. Movies: Cannes 2013 is well underway, and as there are a number of films and directors I’m interested in making appearances this year, I’m been following the goings on. My go-to source for Cannes information and reviews is The Guardian. Neil Young’s Film Lounge has also had some useful notes, including updated odds on the Palme d’Or, Best Actor, and Best Actress picks. It so happens that as of this morning, the Palme d’Or favorite is Like Father, Like Son, the latest from a favorite director I’ve mentioned often here, Hirokazu Koreeda. Also on the list are other personal favorites like Jia Zhangke and Jim Jarmusch. Speaking of Koreeda, a DVD set of his recent television series Going My Home has just made its way to me. Koreeda will temporarily be supplanting Yasujiro Ozu in my Sunday Nights with Ozu as I work my way through the series on Sunday evenings, starting tonight! I am hopeful that I have turned the corner with regards to keeping my blog a going concern. Tune into this space to see whether or not laziness wins out. To close out today’s Salon, let’s all dance! Here is the wonderful “Madison” dance from Band of Outsiders, with spoken digressions provided by Godard himself. Anna Karina sure looks great in a hat. Claude Brasseur and Sami Frey look nice too. Scene dance of Bande à part (Jean-Luc Godard) from sebastiansll on Vimeo. Many of us know at least one person who is resistant to the attractions and complications of modern, frantic, high tech, commercial life. Some people take action – small, achievable steps like growing some of one’s own food, joining a food co-op, riding a bicycle or walking to work, using less electricity, and so on. A few go even further in taking themselves “off the grid.” Subtitled “Japanese Lessons in Simple Living and Inner Abundance,” Couturier’s lovely and valuable book – based on articles he wrote for The Japan Times – profiles eleven men and women who have given up contemporary Japanese urban life and found more sustainable alternatives living in the countryside. Most of these eleven people share characteristics, aside from the fact that most of them know (and, in a couple of cases, are married to) one another. Most of them are artists. Many are political activists in areas like the environment and nuclear power. Most have traveled widely, finding especially formative experiences in India and Nepal. Most are farmers who produce their own food, avoiding the use of pesticides and other chemicals, and live without electricity.